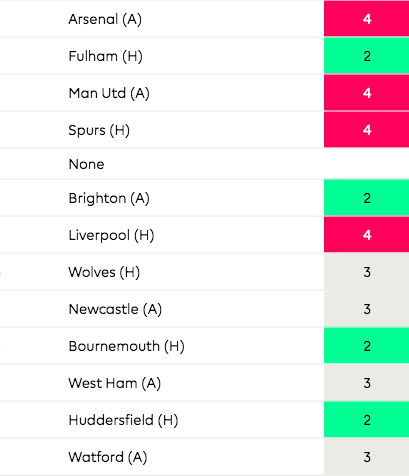 Comparing NUFC’s run in to all 7 relegation rivals – A must read for all Newcastle fans.. – NUFC blog – Newcastle United blog – NUFC Fixtures, News and Forum. With 12 games remaining and us lying just 1 point above the relegation zone, the risk of us dropping down to the Championship is still at large – even if our form has improved considerably since the turn of the year. Huddersfield and Fulham are now in perilous position, but it feels like there’s a battle between everyone between 13th and 18th for that final spot – with the loser likely to go down in third bottom. 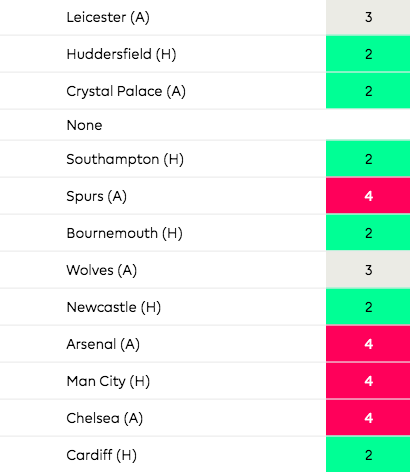 Here’s our run in – as well as the remaining fixtures for all of our other relegation rivals from Palace in 13th to Fulham and Huddersfield in 19th and 20th. Our run in is the most favourable of all the relegation candidates and this, combined with our impressive record against fellow strugglers, makes me pretty confident. Rafa tends to end season’s strongly and we’ve also been boosted by the arrival of Almiron, so we’re in a strong position – with home games against Huddersfield, Burnley and Southampton to come, as well as winnable away trips to Bournemouth, Brighton, West Ham, Leicester and Fulham. 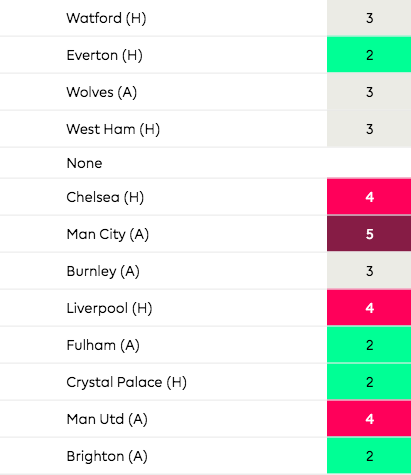 We must improve our home form, but with just two of the top 6 left to play, you’d back us to pick up more than enough points over this run of fixtures on current form. Palace are only 3 points above the drop zone, but I really can’t see them going down. 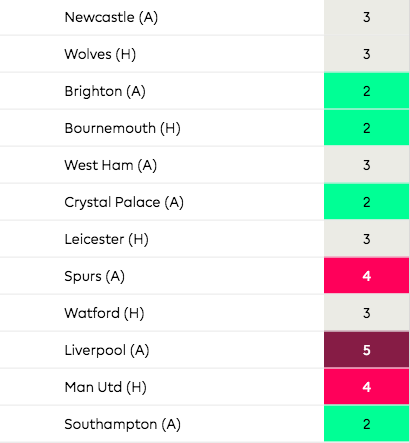 They still have four of the top 6 left to play, but they have plenty winnable games, are strong at home and have a very solid defence at one end and the likes of Wilfried Zaha at the other. Brighton looked set for a comfortable mid-table finish just a few weeks ago, but 4 defeats and a draw in their last 5 has seen them get pulled back into the relegation mix. Their final few fixtures are VERY tough – featuring games against Arsenal, City and Chelsea – but they have several winnable matches coming up. That said, they are now under pressure to make the most of that and get points on the board at a time where they’re massively out of form. I think they’ll turn it around and be fine, but they are in desperate need of a win or two to stop the rot. Fail to do that and they could be in deep trouble all of a sudden. They stunk of a team heading for relegation a month or so ago, shipping goals for fun and struggling to score, but they’re now unbeaten in their last 5 and are picking up points regularly all of a sudden. 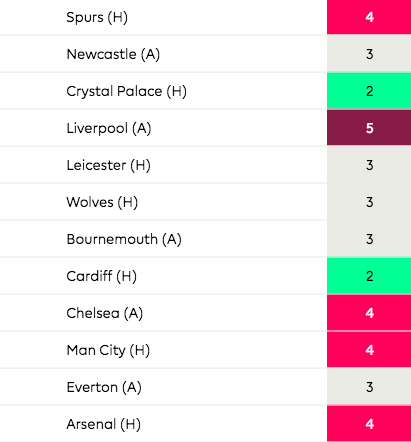 Their remaining 12 fixtures aren’t easy at all, however, with them due to face 5 of the top 6, as well as having games against strong mid-table sides like Wolves, Everton, Bournemouth and Leicester to come. Every match is big at this stage, but our game against them at St James’ Park next Tuesday really is huge game for both sides. I thought they’d fade away as the season went on and struggled to see how they’d turn it around after the tragic death of new signing Emiliano Sala, but they’ve been excellent – and they have four tough but winnable games coming up against Watford, Everton, Wolves and West Ham. 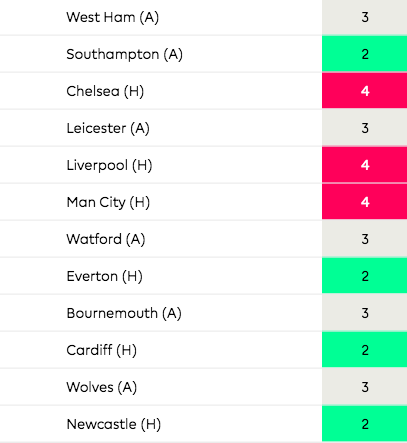 They have 4 of the top 6 left to play in their final 8 games – and they’ve tended to struggle against the top sides so far this season – so I feel it’ll come down to their ability to make the most of their ‘winnable’ home games, with the majority of their points coming in Wales this season. Ralph Hasenhüttl gave them a new manager boost, but they’ve not won in their last three and have a horrible run of fixtures coming up – with Arsenal, Man Utd, Spurs and Liverpool to come in 4 of their next 6. 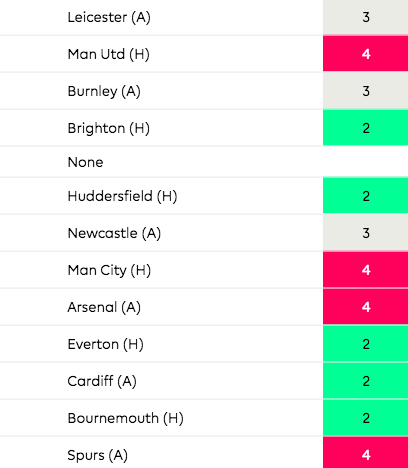 Their final 6 games look winnable, but they could find themselves slightly cut adrift by then if they don’t pick up any points over the next month or so. I thought Ranieri’s arrival might have given them the boost they desperately needed, but that’s yet to happen. We’re 8 points clear of them, so if we don’t keep above them between now and May then we won’t deserve to stay up – but I can’t see a world where that happens. Mitrovic is their star man, but they lack energy, organisation and are so, so soft at the back. They’re going to have to win at least 5 or 6 of their final 12 games to stay up and, with just 4 wins in 26 games so far, I just don’t see it happening. We’re currently 14 point above Huddersfield so it’s fair to say they’re already gone. We now have a huge chance on Saturday to beat them in what must be seen as a VERY winnable game. Personally, I think we’ll be fine. 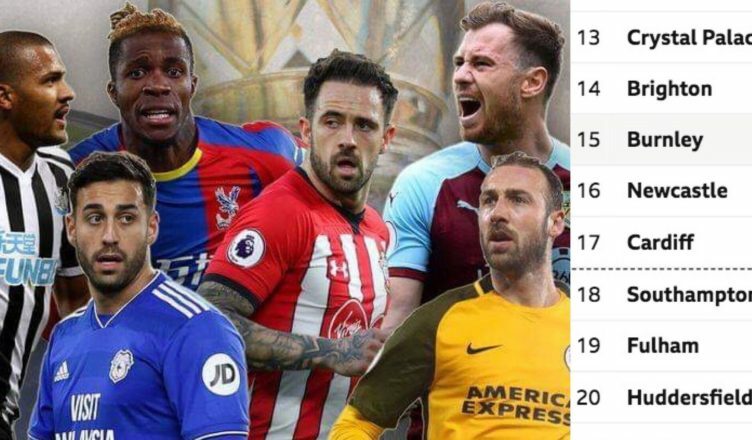 The fact we are 1/8 to stay up with the likes of 12 Bet will tell you all you need to know if you’re someone who bets on Premier League football! I don’t see Palace or Brighton being dragged into it either, meaning Cardiff, Southampton and Burnley could be left scrapping to stay up in the final week or two of the season. As far as Fulham and Huddersfield are concerned, both are all but down – unless the former perform the great escape, starting with an unlikely win at West Ham this weekend. Not sure about your ratings Olly – think you’re being a bit generous with some team’s chances. What made me laugh was an opening paragraph about what’s going to happen to us in the next 12 games, and then directly under that I get an advert for prostate problems. For a munte I thought it was another article about Ashley. What ratings? Just checking you’ve read the key and don’t think “2” , “3” etc. or green means I’m saying they’ll win. 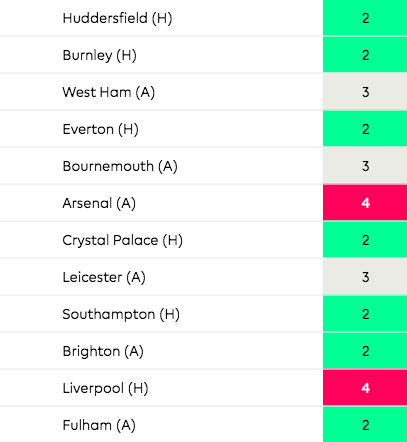 This just shows difficulty level of fixture.